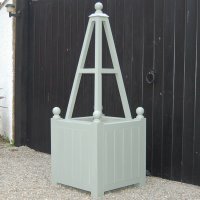 Beech Apple Racks were originally devised to store apples and other garden produce, for use through the winter and were kept in a cool garden shed or cellar. In the modern garden, a Beech Apple Rack is also useful for storing hand tools and other small garden items, packets of seeds, balls of string etc. In the kitchen for utensils, napkins, tablecloths, tea towels. Equally useful as storage for vegetables and fruit used on a daily basis kitchen or larder. Try a Beech Apple Rack by the back door or in the boot room for keeping gloves, scarves, woolly hats even small wellies! We think it makes great wine storage especially it you have somewhere cool and dark to keep it. The Beech Apple Rack will store up to 36 full size wine bottles. External dimensions are 58cm across the front, 46cm front to back and it is 80cm high. Internal dimensions of each drawer are 47cm wide x 38cm deep and the front elevation is 8cm. Each drawer had a slatted base to allow air circulation. In late autumn, lift, remove leaves and stems, then store in moist peat in a frost-free shed. Roots can be kept in this way for 2 to 4 months. Alternatively, use the leaves and stems. Leave some roots in the ground and cover them in soil to blanch them. Then harvest them in spring and serve raw in salads, they will maintain their flavour, consistency and nutritional value, or leave them un-blanched and cook them like spinach. cooking, you can rub the peel off. Squeeze diluted lemon juice or vinegar over cooked roots to prevent discoloration. excellent source of iron and are not difficult to grow. this way. Salsify and Scorzonera do not freeze well. iron and are not difficult to grow. Salsify, also known as the oyster plant or vegetable oyster, and scorzonera, have narrow, ribbon like foliage and long skinny tap roots which have a delicate flavour and can be eaten steamed boiled or fried. Their flower buds are delicious fried in butter or added to an omelette and the young shoots and leaves of scorzonera can also be eaten. The flowering shoots and buds of salsify and scorzonera, have a very delicate and attractive flavour, while the petals of the pretty daisy like flowers can be used to decorate salads and risotto.